LIVONIA, MI--(Marketwire - Jan 27, 2012) - Wedding planners in southeastern Michigan have access to an abundance of venues for hosting elegant ceremonies and wedding receptions in Livonia, and savvy planners also utilize the attentive hospitality and relaxed atmosphere of the newly renovated Fairfield Inn Detroit Livonia to welcome out-of-town guests. Conveniently located near many of the area's premier wedding sites and just minutes from DTW Airport, the hotel is ideally situated to provide guests with everything they need to enjoy the celebration. Whether the wedding is set for Burton Manor, The Inn at St. John's, Meadowbrook Country Club, Laurel Manor, the Italian American Club, St. Mary's or the Livonia Knights of Columbus Hall, guests will feel right at home with group accommodations in Livonia, MI offered by the Fairfield Inn. Welcoming guests with the comforts of home and plenty of complimentary amenities, wedding planners can be assured their guests will rest easy as they are pampered with attentive service and an inviting ambiance. As an added amenity for those utilizing the hotel's Livonia group accommodations, the Fairfield Inn Detroit Livonia offers transportation from the reception so no one has to worry about driving. And, with discounted group rates for bookings of 10 or more guest rooms, everyone will be happy with the great value of these remarkable hotel accommodations. Guests of Livonia, Michigan wedding receptions staying at the Fairfield Inn Detroit Livonia hotel will enjoy a variety of spacious guest rooms and suites to best fit their needs whether traveling alone or with the family. From a single guest room with a King-size bed to a Studio suite and King suite, the Fairfield Inn has plenty of options and offers a myriad of amenities starting with soundproof windows, International cable/satellite service and premium movie channels. Complimentary high-speed wireless Internet access, phones and voicemail service are standard in every room, and all are furnished with comfortable beds topped with crisp linens and down comforters for a relaxing reprieve. Rooms also include a refrigerator and microwave, large desks and a MediaHub for easy connectivity. With its convenient location just off I-275 and 6 Mile Road, those attending Livonia wedding receptions also have options for enjoying nearby attractions. The Arctic Edge Ice Arena, Metro Park, Laurel Park Place Mall, Twelve Oaks Mall, the Canton Sports Complex, Detroit Zoo and Pewabic Pottery are just a few of the many destinations that can easily be accessed from the Fairfield Inn Detroit Livonia. 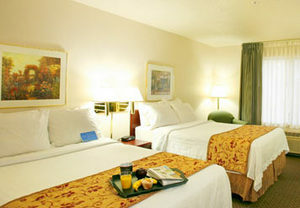 The Fairfield Inn Detroit Livonia hotel welcomes guests with inviting home-like accommodations and lavishes them with complimentary services including a warm and hearty breakfast, complimentary Wi-Fi throughout the hotel and plenty of free parking. For added convenience and relaxation, the hotel also offers a sparkling indoor pool and hot tub with a walk out patio area and well-equipped 24-hour hour fitness center. Wedding planners in southeastern Michigan have access to an abundance of venues for hosting elegant ceremonies and wedding receptions in Livonia, and savvy planners also utilize the attentive hospitality and relaxed atmosphere of the newly renovated Fairfield Inn Detroit Livonia to welcome out-of-town guests.